Kufr Qaddum was without the electricity since 11pm on Thursday night. 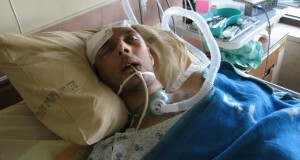 Six villagers who are dependant on oxygen machines have been evacuated to the nearby hospital in Nablus. The following morning, at the Friday village demonstration, a young man was hit in the head by a gas canister and was taken to the hospital as well. 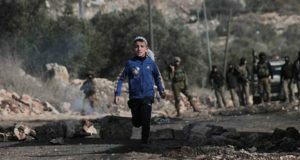 Since 2011, villagers from Kufr Qaddum demonstrate each Friday against the Israeli military. 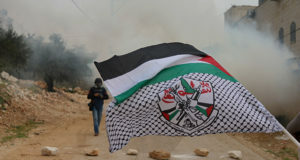 The village of Kufr Qaddum has had much land stolen by the nearby illegal settlement of Qedumim and in 2003 the main road connecting Kufr Qaddum to city of Nablus was closed to Palestinians. 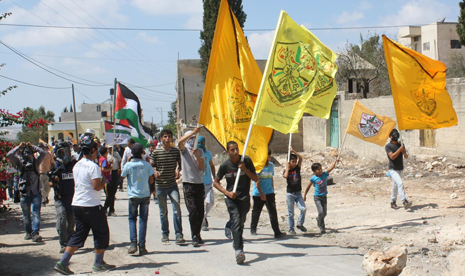 “Protests would not stop until the main Kufr Qaddum road, currently usurped by the illegal Qedumim settlers, is returned to us,” the resident added. The military bulldozer was already at work attempting to clear the rocks demonstrators had placed on the road to prevent the army vehicles from entering the village. As the demonstrators attempted to repel the bulldozer, a group of soldiers tried to keep the protestors away from the bulldozer with continuous barrage of tear gas, frequently fired directly at the protestors, a practice which is against the army’s own regulations, as it turns the “less-lethal” crowd dispersal means into a small rocket. Early on in the demonstration, a young man was hit in the head by a tar gas canister and was taken to the hospital where he was treated and later released. The army withdrew at around 3pm.